In recent months there’s been outraged wailing about the injustice of California’s water limitations. Insufficient public funding for expensive new dams. Most recently, higher percentages of unimpeded flows destined for the Delta. In both cases, questions have been posed: How can we possibly recharge aquifers without the new dams, or those flows? Where will the cold water needed by fish come from if we allow those flows to lower reservoirs? It’s as if groundwater recharge and cold water flows were only made possible by 20th century engineering. As I’ve been striving to point out on this site, there remain viable untapped options for addressing both those concerns, despite present limitations. But the wailers can’t see them because their vision is locked into patterns they have trouble breaking free of. All need to take a deep breath and free our minds from our former one-track perspectives. I’ve published yet another new page in the Alternate Paradigms section of this site, Surface Water Diversions vs Baseflow Augmentation, hopefully helping to make the point I’ve been striving to convey throughout this entire website. There’s another, more feasible way of increasing groundwater recharge, less costly and likely more effective than engineered diversions of surface water, including from new or existing dams, or even from flood flows. More feasible because it doesn’t rely on surface waters already encumbered by existing water rights nor on engineering feats to capture flood flows in efforts to apply them to already saturated lowlands. That is, to increase the natural recharge capabilities of lands whose infiltration and percolation functions have been degraded through historical land uses. By restoring the natural ability of rain to enter the ground right where it falls, percolating from there down through the vadose zone to bedrock aquifers, draining to alluvial aquifers, you enhance baseflows, i.e., low water flows, that are naturally cold because they are fed by groundwater. Reservoir bottoms are neither the only nor best place to get the cold water needed by fish and other aquatic life. So where are these degraded lands? Hidden in plain sight. Vast expanses of nonnative annual rangelands ring the entire Central Valley and extend down the Central Coast through the Cuyama Valley. These lands lie upslope of the agricultural activities that consume most groundwater, so they are perfectly positioned to feed those basins. As I’ve strived to make clear on pages: California Case and California “Grasslands” vs. Altered State(s) and in blog posts 1. Water Storage & Water Available for Replenishment/ Recharge, 4. Think Outside the Basin and 6. 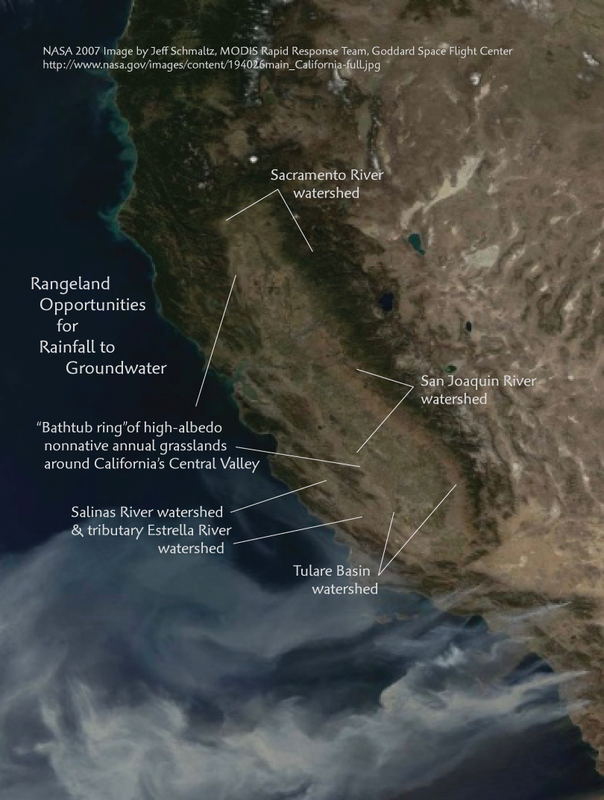 Ball & Chain, opportunities abound in the vast majority of the watersheds/ catchments of overdrafted California groundwater basins, whose rainfall detention functions have all been degraded through historical land uses. FYI, the high-albedo (light reflectance) referred to there plays a role in biospheric feedbacks with regional climate. If we restore more natural, less reflective land covers to these lands, we just may induce some increased precipitation across the region. I’d love to share more about that, but it’s a relatively complex whole systems issue and it seems appropriate to let y’all catch up with the simpler details of how watershed/ catchment restoration will enhance natural groundwater recharge first. Then there are also the degraded and minimized riparian zones to consider – in terms of water quantity, not just water quality and habitat value, as has long been the traditional argument for them, elaborated on in the Rainfall to Groundwater Executive Summary. I’ve shared a LOT to date, perhaps too much for this time of partisan sound bites and knee-jerk reactions. And I sure ain’t been getting rich from it. Barely any acknowledgement/ appreciation. On the contrary, having quite skillfully (NOT) broken my right ankle in four places early May, requiring surgery that month, and precluding driving, I’m now facing significant hospital, among other bills, and still dealing with a related toe fracture. Despite all that, I somehow managed to work up the Rainfall to Groundwater Executive Summary and blog post 5 DWR, Great Job on WAFR! Now Add R2G that month. I give myself an A for effort. But, as has long been clear, those As don’t pay the bills. So here’s a heads up that the fees on Course Pre-Enroll & Sponsorship Order will doubtless be increasing soon. And BTW, I haven’t seen any other options for the nature of instruction I offer, especially pertinent to Groundwater Sustainability Agencies, but really for anyone who cares to learn more about this. You could wait for me to publish, then read my books, but they will not offer the kind of specialized planning instruction envisioned in Planning for Rainfall to Groundwater, for example, as well as other courses noted on Learn, Apply that I have yet to fully outline. For those who may have been sitting on the fence about pre-enrollment, if you act soon, I will honor the fees currently shown on the Order page. I can’t say right now exactly when changes will happen, but assure you they are afoot. While I generally prefer the less formal use of my first name, I’ve been influenced lately by other women in the media urging us female PhDs to own our hard-earned titles. So this time I’m signing off . . .